Hidden from the busy street, Paul and Leisa’s house sits behind a smaller traditional home they share a driveway with. Their house, placed in the middle of their block, is tucked almost completely away from street view and surrounded densely by trees. The lush yard and surrounding gardens serve as a canvas for Leisa’s green thumb. Walking out into the expanses of the backyard, Leisa remarks, “I bet you never thought this was back here, did you? You feel like you’re out in the country when you’re in the city,” as she looks upward toward the tops of the soaring trees. The home itself is an expansive, low-slung brick ranch with an “L” shaped footprint, and flat roof. 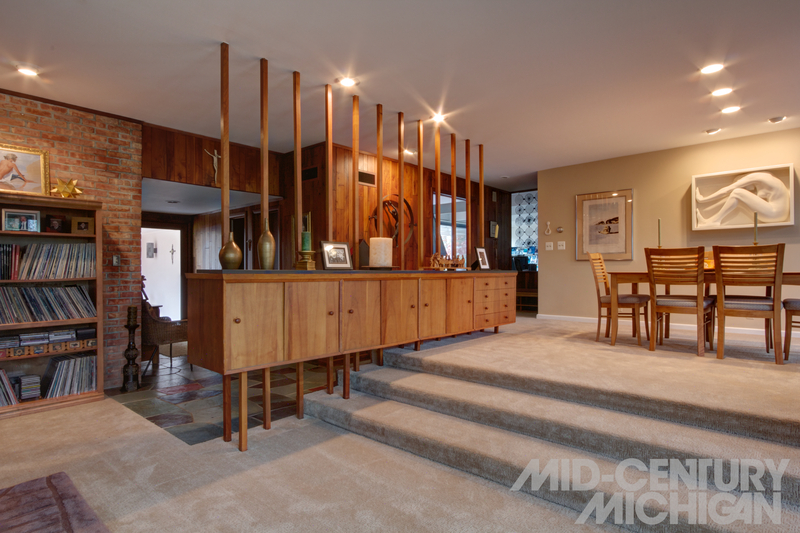 Its proportions and deep covered entryways seem immediately familiar to those keen to modernism. An attached carport is indicative of its mid-century modern roots. “The original clients ran out of money and couldn’t afford a garage door,” jokes Paul with a bit of irony in regards to the home’s otherwise luxurious fit and finish. Materials such as slate, marble, brick, cherry, and rosewood compose the interior surfaces. 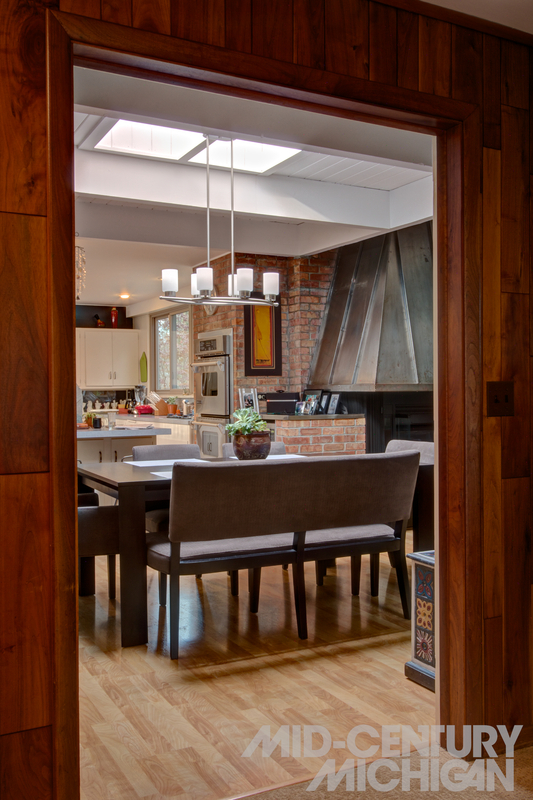 The formal living and dining area make the most of the materials, with exposed brick walls and a cascading floor plan which descends from dining area to living area. A long, suspended rosewood-clad credenza spans this change of levels, supported by a series of balusters which are anchored to the floor and ceiling. 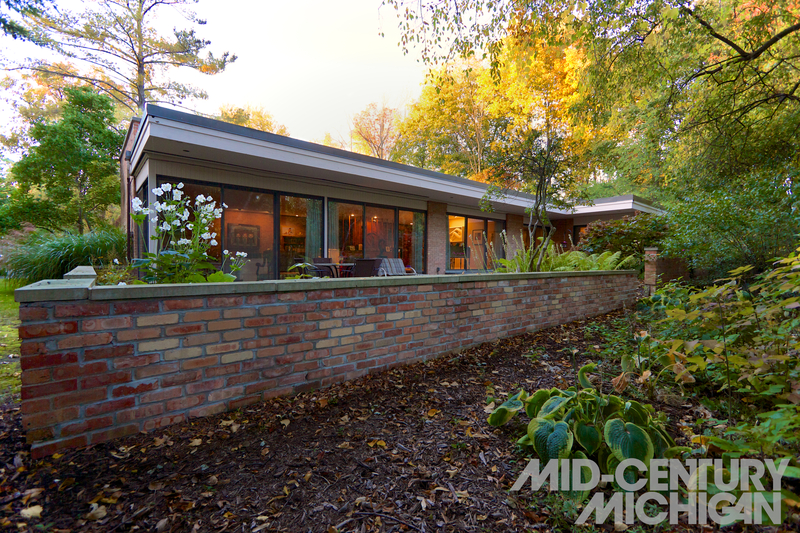 A wall of glass looks out onto a bi-level patio, enclosed by a short wall of brick. At the far end of the room, a wide, low fireplace sprawls across an entire wall. And that juxtaposition of privacy and openness is exactly the reason Paul and Leisa were originally drawn to the house. “After living here I’ve realized I couldn’t live in any place where I can’t feel like I’m outside when I’m indoors, because I love to be outside,” Leisa adds. And with so many views to the outdoors, and an enclosed backyard, the setting is ideal for the family’s lifestyle, which involves four dogs and plenty of outdoor time in the Michigan summer. Only steps from the kitchen and family room, their backyard patio with built in grill and pergola serves as an ideal setting for meals and relaxing with friends and family. The bedroom wing of the home has four rooms, symmetrical in layout, and set up on two levels which bisect the main floor. Stairs that lead up and down to the levels create an intersection of multiple floors offset from one another. This area serves as living quarters for the couple’s two mature sons, as well as an office and music studio, which the boys make the most use of.